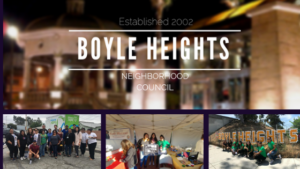 The Boyle Heights Neighborhood Council (BHNC) was established on May 21, 2002, when it received its certification from the City of Los Angeles. Since then, the BHNC has continually served its community of now close to 100,000 residents by creating local partnerships with the community libraries, the local police station, civic engagement leaders, non-profits, advocacy groups, businesses, and schools. As an advisory board to the City Council the BHNC takes on important issues affecting the community such as tackling contamination/pollution issues and creating ongoing dialogue about ways to abate it, homelessness, development and displacement, public safety, know your right’s forums around immigration issues and voter’s education. Join us and make a difference locally.